The problem: You buy your wife or girlfriend a gift but don't want to take the time to wrap it by yourself. However, you also don't want to have it professionally wrapped, because this would be a dead give-away that you didn't do it yourself (not very romantic!). The solution: Crapwrap. Firebox.com is willing to ship your gift pre-wrapped with cheap wrapping paper, complete with tears, stains and hair on the tape. The company is currently paying 20 of it's male forklift drivers to wrap gifts for men who want their gifts to have that done-it-myself look. The forklift drivers are instructed to quickly wrap the gifts using as little care as possible. They use brown tape, inexpensive paper and nail-scissors for cutting the paper. The end result is a gift that looks like it was wrapped by, well, like by a man. The service costs around $7. They will even send it to the post office in a brown paper wrapper with a badly-tied pink ribbon. Claire Wood of Firebox.com said, ‘Nearly as many people are asking for CrapWrap as for our normal gift-wrap. 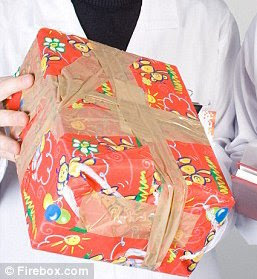 Women like to think that their husbands and boyfriends took the trouble to wrap the present themselves, even if they made an appalling hash of it. That is hilarious. Only men would be this ingenious to enable their own laziness.